Here's my Christmas present to you this year: my sugar cookie recipe! I guess technically I've already posted it on the blog in years past, so perhaps it's a bit of a re-gift, but don't let that stop you from enjoying it! These sour cream cookies are so soft and moist, and with a silky sweet coating of royal icing they're seriously the best sugar cookie you've ever had! Chris and I made them for the dessert table at our winter wedding and I must have been asked for the recipe at least 15 times. So if you're doing a bit of last minute holiday baking this weekend, think about giving these cookies a try. The dough couldn't be easier to prepare, both the dough and the cookies (un-iced) freeze well, and they're a classic Christmas favourite! 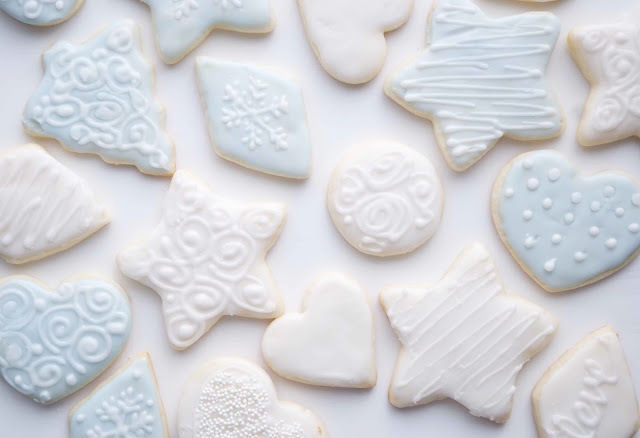 When the baked cookies are cooled and ready to be iced, mix up a batch of royal icing. For my icing I use a loose recipe that looks like this: 3 cups of icing sugar, 1 egg white, 1 tsp almond extract + enough warm water to get it to the consistency I want. I can't tell you exactly how much water to use as it tends to vary. But the royal icing should be thick, runny, and wet. If it's too thin it will run, and if it's too dry it will crack and refuse to spread. And I just mix it all the ingredients together with a spoon! Dip each cookie into the bowl of icing, face down. Remove cookie from the icing, shake off excess icing, or slide off excess using a knife or spatula. Use a small spatula to smooth out the coating of icing if needed. Leave cookies to dry for an hour. Then put the remaining icing into a piping bag, cut off the tip (leaving only a small pin point of a hole), and pipe little dots, lines or squiggles onto the iced cookies. 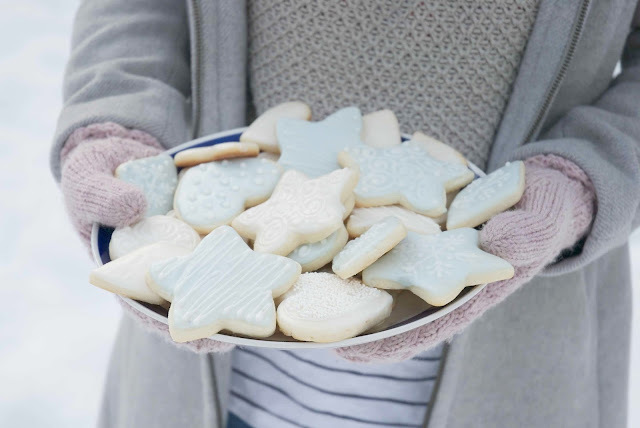 I find working with white on white is very fool-proof, so start there and then branch out into pastels; the cookies will look pretty, polished, and professional! Let the cookies dry for a few hours, or even overnight, before placing them in a tin. You may stack them if you place a layer of wax paper in between each layer of cookies. I hope you enjoy this recipe! Pass it along, or make it your newest secret family heirloom! I have just started making my own sugar cookies with royal icing and right now I am using almond extract and basic food color to paint on my cookies or for piping. What are you using here to achieve pastel colors? Do you have any other tips about what works best when trying to get a variety of colors.